Just a page where I can keep track of my discoveries here on the Eastern Shore and at the Wabi-Sabi Ranch. My memory is not what it used to be, and I often find myself looking up the same flowers or trees or animals over and over before it sinks in. This page might make it easier for me to remember, or at least make it easier to look up something I’ve already looked up several times in the past. 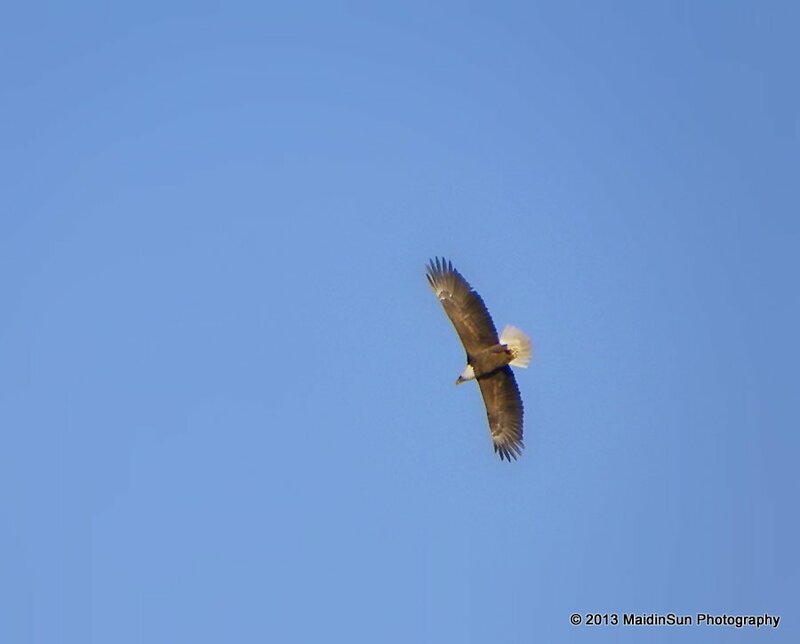 During the summer months, I saw the occasional Bald Eagle soaring overhead. In December 2013, I had the good fortune to witness three Bald Eagles dancing, whistling, and flying in the sky over the woods and meadows at the front of the property. It was an amazing sight, and I watched them for at least an hour. The Bald Eagles begin preparing their nests in the fall, and lay their eggs in January. The number of eggs depends upon how good the fishing season happens to be. If it’s a good season, they will lay up to three eggs, and I’ve been told that there is a nest in the area where the eagles had four eggs which is pretty rare. 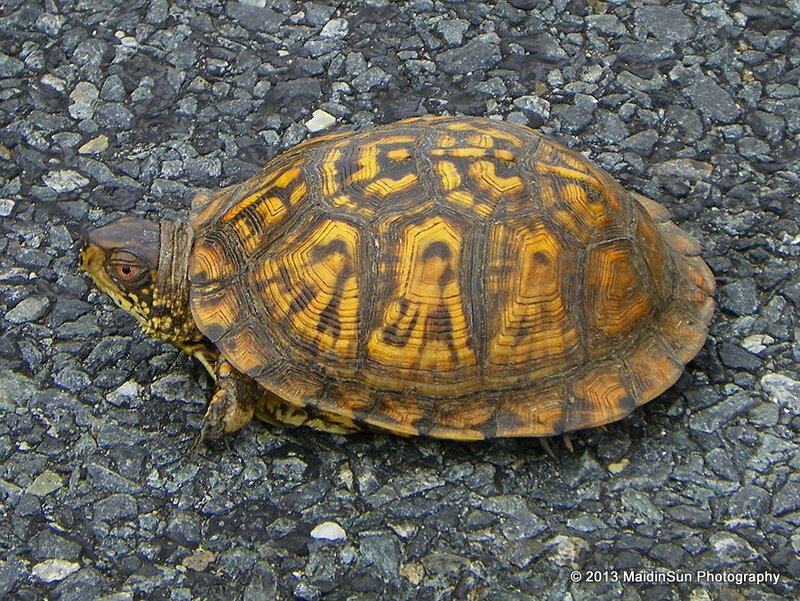 The Eastern Box Turtle is found exclusively in North America. They are omnivorous creatures who eat all sorts of things including snails, eggs, birds, berries, roots, flowers, and fungi. They may live more than 100 years. One of the things I find fascinating about them is the hinge on the shell. When frightened, they can duck inside and close the door, so to speak. Box Turtles can be poisonous to eat (not that I’d want to eat one) because they eat poisonous mushrooms and the toxins may linger in the parts you’d eat if you were to eat one. 2016 June 22. Finally! 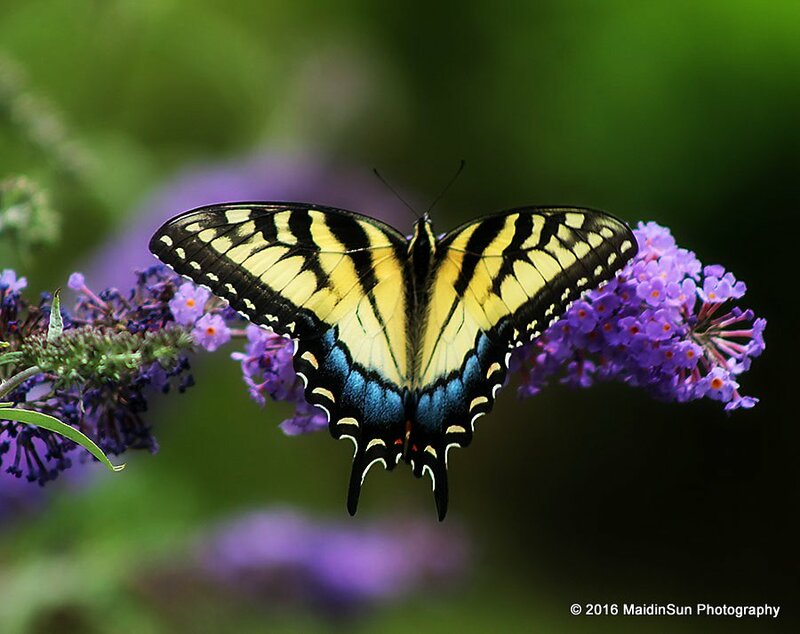 A large butterfly visiting the butterfly bush. 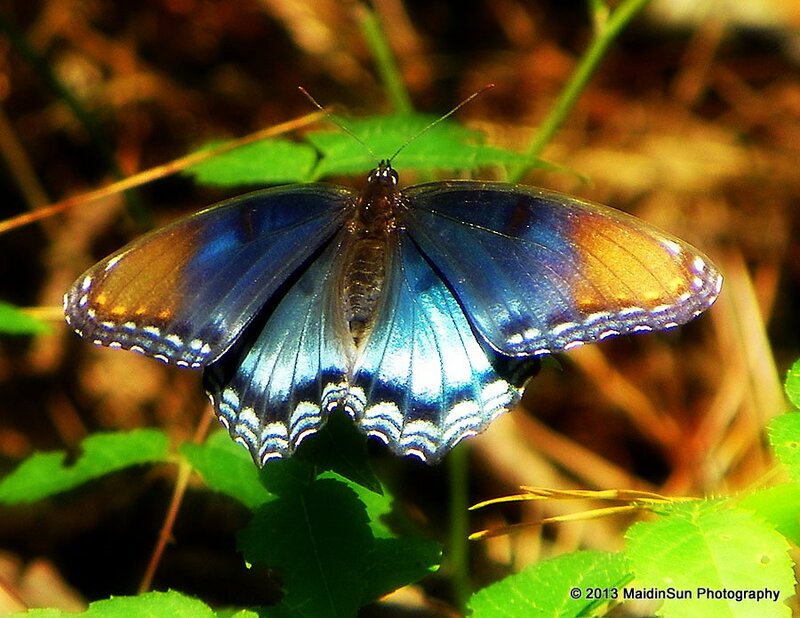 It was an Eastern Tiger Swallowtail (Papilio glaucus). I planted the butterfly bush in the scrounger’s garden three summers ago, and this is the first time I’ve had a swallowtail visiting it (that I know of; they could be sneaking out there when I’m not around). 31 August 2014: Outside the guest room window. 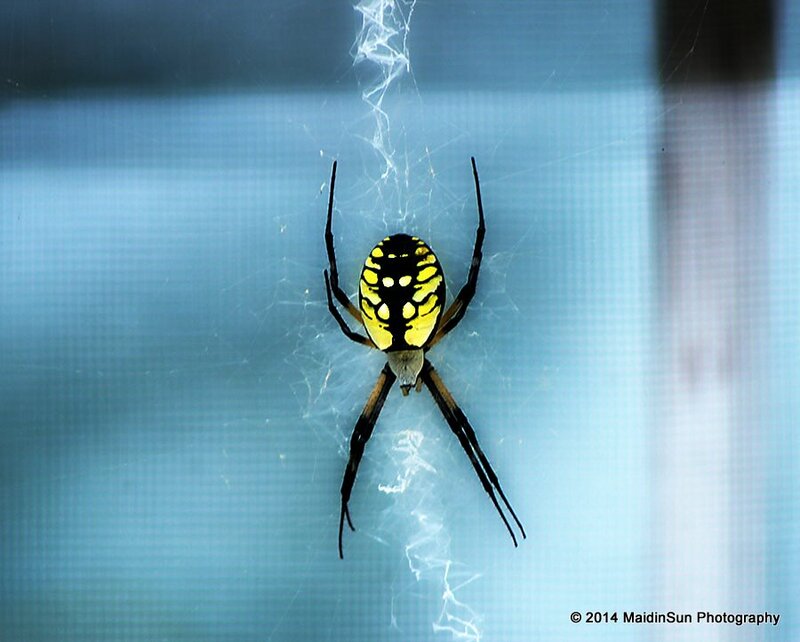 Argiope aurantia, what I know as the Garden Spider, is also called a Corn Spider, a Yellow and Black Garden Spider, and, my favorite, a Writing Spider. This particular beauty stationed herself outside of one of the guest room windows. 2015 June 28. In the scrounger’s garden. 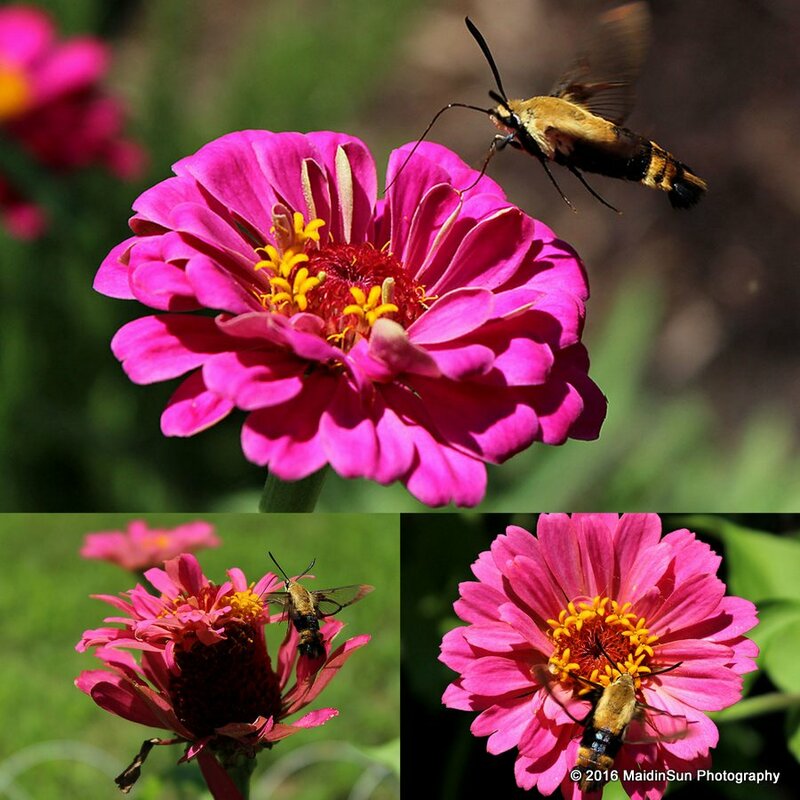 I frequently see these little guys in the scrounger’s garden around the end of June when the lavender, zinnias, and butterfly bush are blooming in full force. 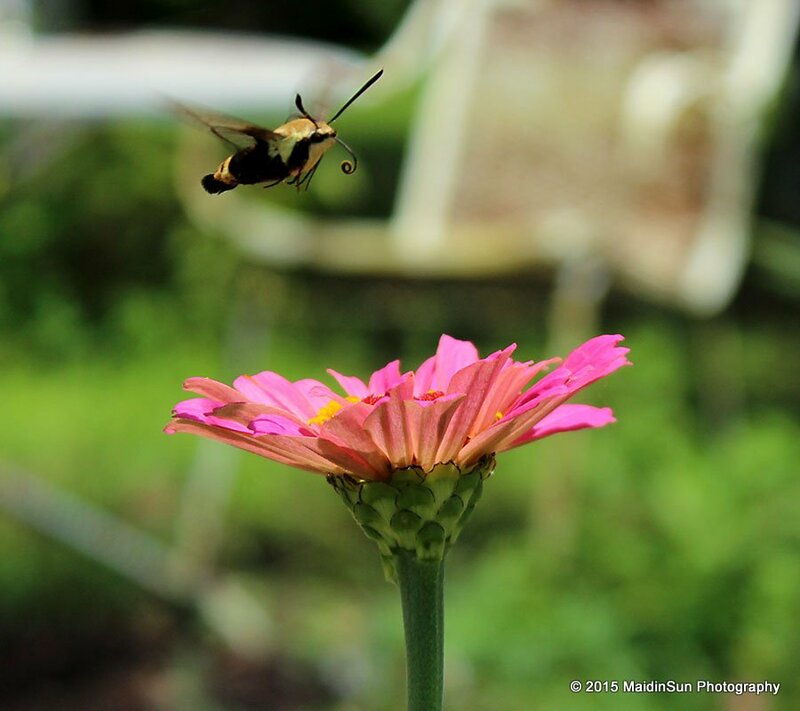 In folklore, hummingbird moths are seen as a good omen. The larvae like to feed on honeysuckle plants. I’ll have to keep an eye out for the horned caterpillars (which are green with a dark red spot and green lines on the body). Danaus plexippus (the scientific name means “sleepy transformation”) will hopefully continue to be a visitor to our gardens. Pesticides, loss of habitat, and climate change are bringing down their numbers. To help, you can plant milkweed. 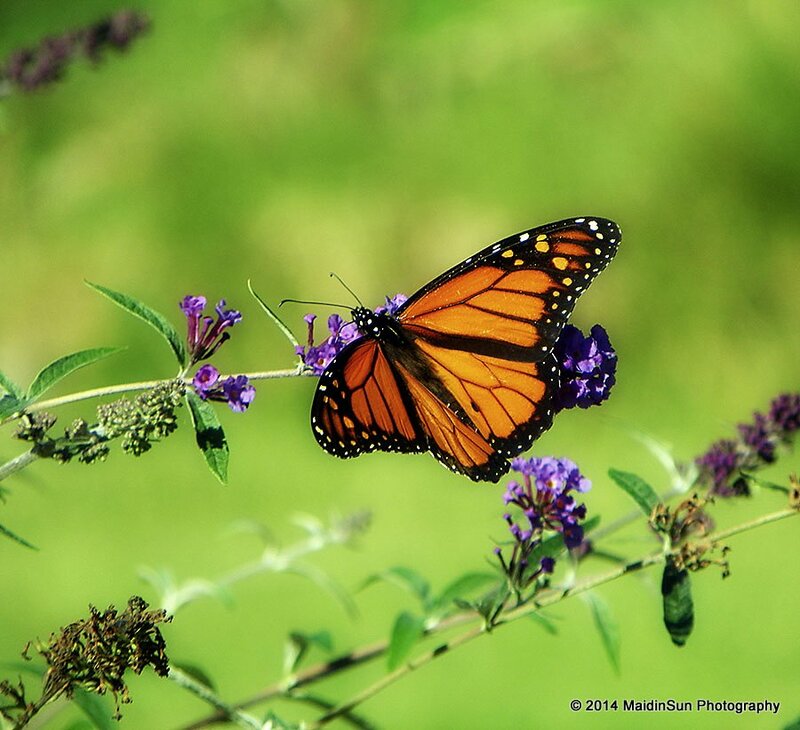 Visit Live Monarch for seeds and to find out more about the Monarch’s plight. 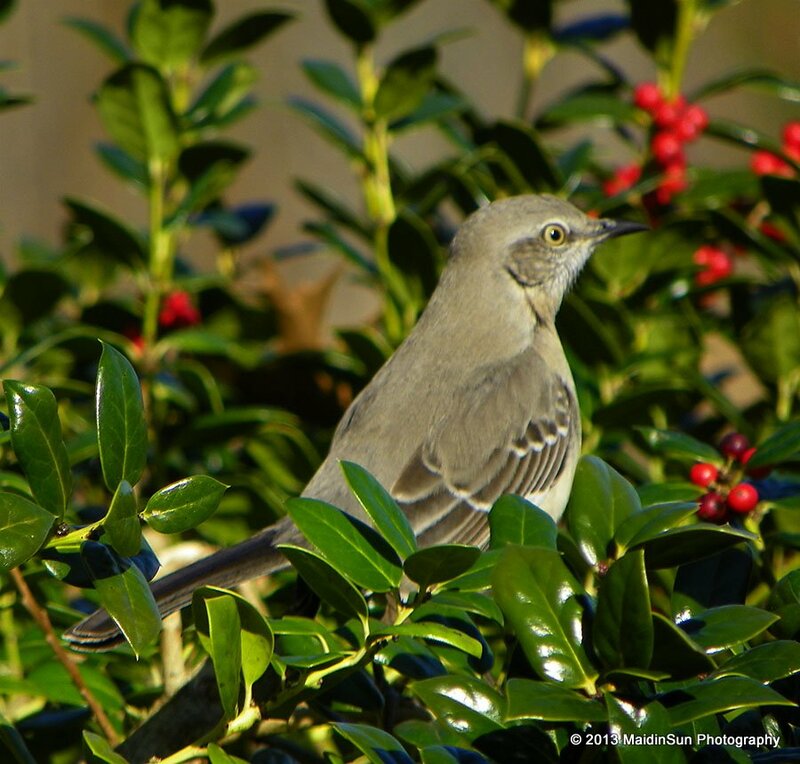 The Northern Mockingbird is a source of entertainment around here. This guy has quite a repertoire of songs. Males may learn up to 200 songs during the course of their lives. Pretty amazing. 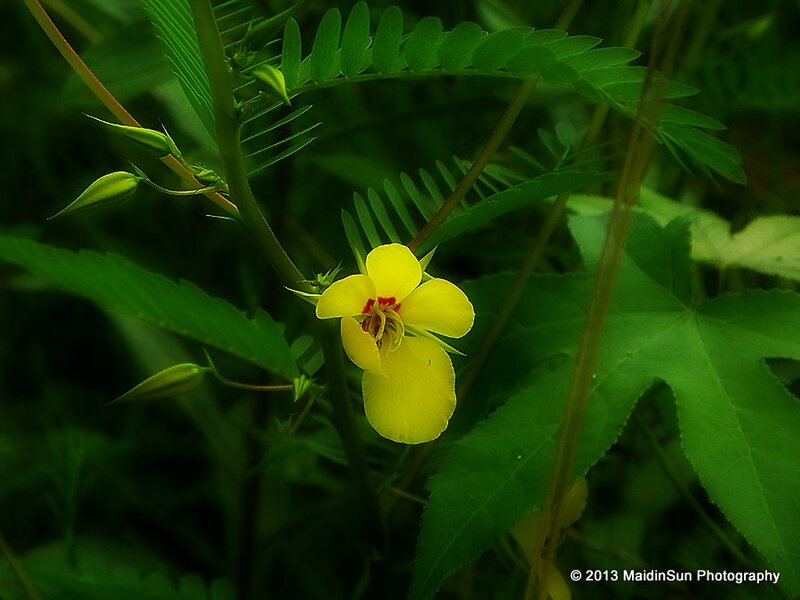 The Partridge Pea is a native, upright, annual legume, that routinely appears on recently disturbed land. The seed pods of the Partridge Pea, which ripen by late October, are a winter food source for the Bobwhite Quail. White-tailed deer can and will eat it, too. Veronica persica. Found near the street at the front on the property. 09 March 2014. 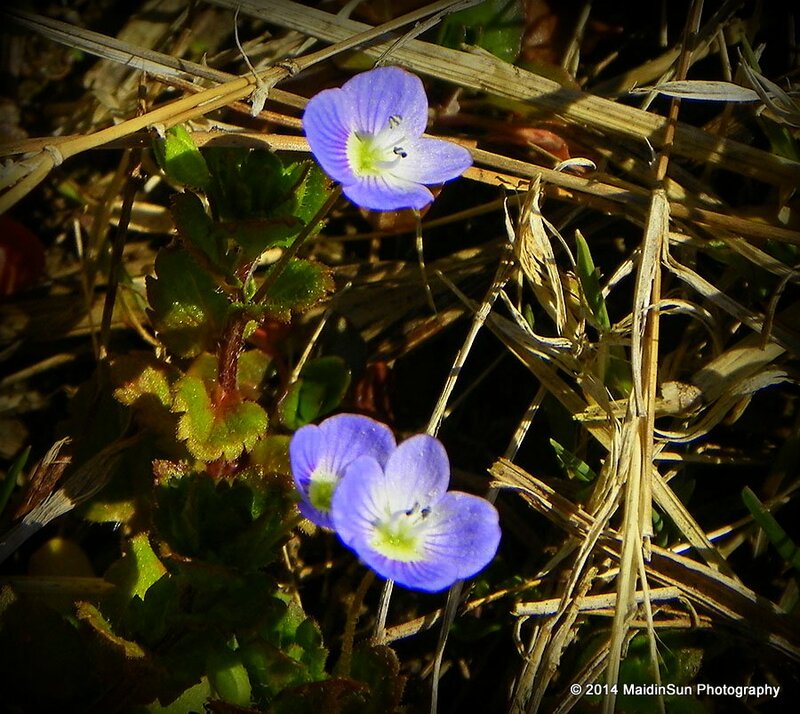 Persian Speedwell is native to Eurasia, and generally seen as a weed. I happen to like the tiny, and very pretty, blue flowers. November 2013. The pictures are not very good, but good enough to help me remember this bird the next time I see it. They are common in this area and eat mainly insects, spiders, and other arthropods. They will also eat seeds, nuts, and fruits. I’m not sure what type of Sumac this is. My best guess is Winged Sumac (also known as Flameleaf or Dwarf Sumac). The berries provide food for a variety of wildlife during the winter months. I’ve seen Eastern Bluebirds eating the berries on several occasions during the late fall of 2013. 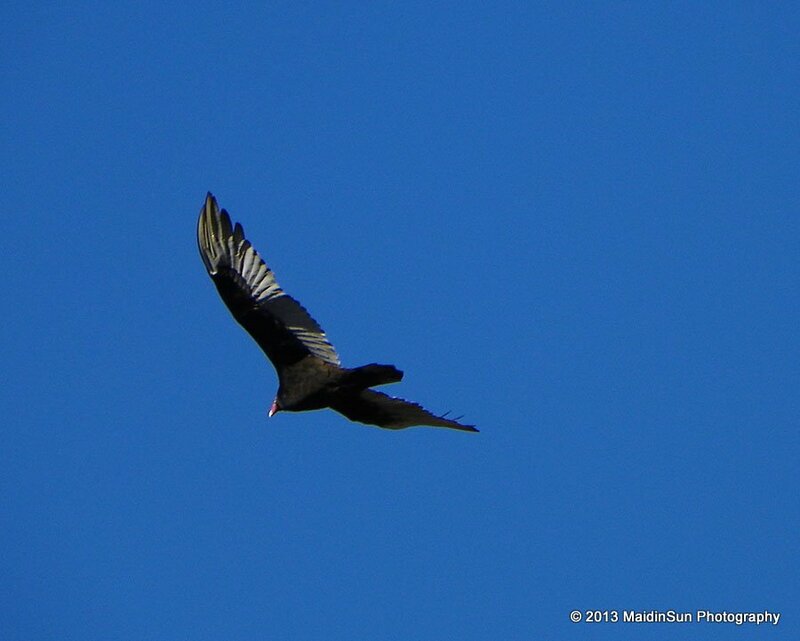 The Turkey Vulture is also called a Turkey Buzzard or just plain old Buzzard. We have plenty of them around here, and I’ve seen large flocks of them roosting in the trees or sunning themselves on a rooftop. They are great scavengers, and I enjoy watching them as they glide around in circles. January 2014. The White-Throated Sparrow is, to me, a friendly bird. I have no trouble capturing one with the camera whenever I’m out and about on my daily walk. They feed on the seeds and weeds of grasses, and really seem to like the sumac berries. We have a similar woodpecker here but everything else is unusual to me. What amazing birds you have! Love the turtle too. Hi… I find the blog a great place to store things I want to show people and keep for myself. This is a great idea … We keep a written journal about the wild life we see but this is so colourful! Thank you, Jane. I just saw your comment here. Sorry to have taken so long to respond. I haven’t been doing a very good job of keeping up on this page with the new things I’ve found. Perhaps I’ll have time in the winter months to update it. I’m still astounded by all the discoveries I find living on the Eastern Shore 😀 I moved here from the Midwest almost a year ago and I love it here! Yesterday I saw a bluejay while at work and just had to stop and watch the flashes of blue among the trees. Take care and have a beautiful rest of your weekend! Hi Robin this is the first time I’ve checked out this page in your blog. I think it’s a great idea to keep a record like this, but it must be challenging to keep up with all you see. Thank you, Laura. 🙂 I haven’t been keeping up with this page. I really should update it someday. The name presented itself. So much here had fallen into disrepair or was “left to nature” as they say around here. suits this week’s LAP challenge perfectly!